Everyone here knows I'm a fan of Denise Hunter's books, and I've been waiting on her new series since she introduced the characters in Married 'till Monday. Then I saw the cover to Falling Like Snowflakes, and I was in love. How could I not be? 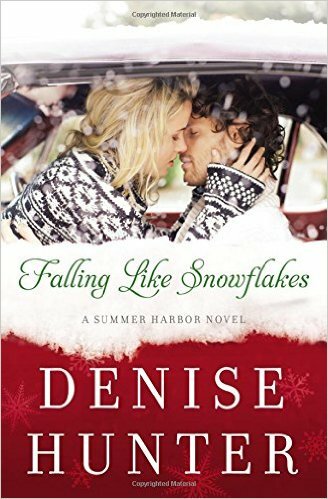 Big cozy sweaters, beautiful snow, two people obviously falling each other...this cover made me want to curl up with a blanket and read--even in the heat of summer! And I did exactly that, in love with each page even to the very end. So here's the blurb, and I'll catch you on the other side. Speeding north through rural Maine, Eden Martelli wonders how her life came to this—on the run with her mute five-year-old son dozing fitfully in the passenger seat. When a breakdown leaves them stranded in Summer Harbor, Eden has no choice but to stay put through Christmas . . . even though they have no place to lay their heads. Beau Callahan is a habitual problem solver—for other people anyway. He left the sheriff’s department to take over his family’s Christmas tree farm, but he’s still haunted by the loss of his parents and struggling to handle his first Christmas alone. When Eden shows up looking for work just as Beau’s feisty aunt gets out of the hospital, Beau thinks he’s finally caught a break. Eden is competent and dedicated—if a little guarded—and a knockout to boot. But, as he soon finds out, she also comes with a boatload of secrets. Eden has been through too much to trust her heart to another man, but Beau is impossible to resist, and the feeling seems to be mutual. As Christmas Eve approaches, Eden’s past catches up to her. This book opens right off with Eden in trouble, which is a departure from most of Hunter's books. This hint of suspense follows throughout the book and allowed Hunter to craft a unique story that still flowed with all the spicy romance and funny banter she's known for writing. The suspense theme never overshadowed the romance, and I enjoyed how she balanced the two. Eden and Beau make a wonderful couple with honest conflict keeping them apart. I love how Beau takes to her son and we see a gentle side to him. It also allowed us to see Eden begin to slowly trust again--it's one thing to trust her own heart with a man, but her son's heart? This dynamic allowed growth in their relationship that was authentic and sweet. The other aspect I enjoyed was getting to know all the Callahans and catching the first glimpses of what is sure to be their stories. I like the slow build-up of the secondary characters as it makes me anticipate the arrival of their books as well. All in all I highly recommend Falling Like Snowflakes. If you've come to love Hunter's books, you'll not be disappointed in this read. If she's new to you, you'll find yourself searching for other titles by her once you've finished. 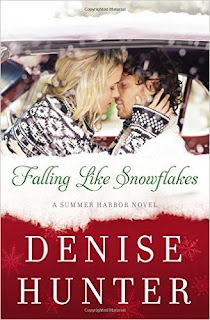 I happily give Falling Like Snowflakes 5 out of 5 stars, and you can purchase it here. Thanks Susan! I am going to keep a list of the books you recommend! Sometimes a girl just need to get lost in a good novel!